Paul Schrader and Martin Scorsese unknowingly formed a legendary partnership in making Taxi Driver (1976) that has left an indelible mark on cinema. Despite their diverging backgrounds, it seemed like they were very much kindred spirits. At least, they understood each other. Scorsese of course, grew up in the Catholic Church even considering becoming a priest. Schrader likewise, had a deeply religious upbringing rooted in reformed theology even attending Calvin College. Aside from both being cinephiles, each man has battled through his share of demons and yet they have come out on the other side no doubt wiser. Thus, with the release of Scorsese’s deeply spiritual passion project Silence (2016) a couple years ago, it seems fitting Schrader followed up with First Reformed soon after. I’m not sure if it’s mere coincidence or not but by this time in their lives, with space for retrospection, they have come to a crossroads to make daring, personal pictures about religious faith. The opening shot is instantly recognizable. We have the stark symmetry of a church steeple. The religious space lacks the same type of iconography as the Catholic Church because the Calvinists came from a tradition foregoing any amount of pomp & circumstance for a stripped-down aesthetic. All the focus was on the cultivation of the spiritual life. There still is history, as this particular church is just about to celebrate its 250th anniversary and it was once a stop on the Underground Railroad years before. The resident reverend’s tours include touting the Dutch Colonial architecture and showing wide-eyed kids the trap doors escaped slaves used to hide in. Now it’s ironically also a spiritual museum-piece — a creaky religious relic — attended by a few stray parishioners. The real center of religious activities is at Abundant Life a well-meaning but somewhat sanitized megachurch set up across the road. Perfectly reflected by their cafeteria wall emblazoned with the words from Acts 2. The story actually begins with an experiment of sorts. Reverend Ernst Toller (Ethan Hawke) will keep a journal for an entire year in a notebook and then he will destroy it. There is an obvious finality to this. He’s set himself a hard timeline. Though he mentions word documents and digital files, he might as well come out of a Bresson picture. His possessions are few and far between. A well-worn Bible sits on his bedside table accompanied by the works of Thomas Merton and G.K. Chesterton. His landscape and surroundings are just as stark and humble. Interiors are kept equally simple and straightforward. The unadorned yet meticulous composition use geography whether structures or a bit of symmetry to set up scenes. Inside the church with the lines of pews that might be plucked directly from Winter Light (1961). Then, along a row of houses in a neighborhood as a car pulls up to a house. One house he pays a call on belongs to Mary (Amanda Seyfried), a young pregnant woman, who grew up in the church and is now worried about her husband Michael’s mental stability as of late. She worries it will affect their future child. The reverend might be able to help. Upon their first dialogue together, it becomes obvious he is not a learned man. He had a stint in jail for his environmental activism in Canada and currently holds down a job at the local Home Depot. But he gives a cogent account of why he does not want to bring a child into the world. By 2050 all scientific analysis seems to suggest dire straits are ahead if we do not make radical changes on an international level. Because climate, water levels, and everything else will not leave man unimpeded. His question is simple. How do you sanction bringing a girl into the world who is full of hope and naivete? Then, she grows up and as a woman, she looks you square in the eyes and says, “You knew it all along, didn’t you?” And yet you brought her into this world of death. Most of what the reverend does is listen to his grief. The only response possible is that the blackness is not a new phenomenon. Man, woman, and child are born to trouble. It seems small comfort. As the themes begin to interweave there are continuous nods to Ingmar Bergman’s Winter Light (1961) from the snow motif to a deeply troubled husband and even a female associate who takes a deep concern in the well-being of our protagonist. You can sense Schrader acknowledging his deep abiding affections for Robert Bresson — an obvious reference point being Diary of a Country Priest (1951) — with a man of faith suffering from a mysterious ailment. It only serves to exasperate his human relationships and give a physical manifestation to his existential crisis. In maintaining the transcendental spirituality of the film, Tarkovsky levitations and Dreyer-like “resurrections” are also evoked and the list goes on and on. In fact, it amazes me how obvious and plentiful the allusions are. Schrader barely tries to hide his affinities for certain pictures. They are most assuredly there being represented and it’s generally satisfying. But it is a film that is also born out of the mind who brought us Taxi Driver and the ties are closer than we might expect. Because it becomes more akin to the desolate alienation of Travis Bickle as the story plods on. After experiencing a tragic death and witnessing the ways the modern world functions, Toller seems to see the need for a martyr in an unjust world. He becomes increasingly alienated. His life involves helping out with the homeless food line, sitting in on the youth small group, and of course, his tours and Sunday duties. But it’s the old conundrum. He feels confined to the walls of his church. It doesn’t seem like he’s necessary for anything aside from spiritual comfort. He has no true impact on people lives and he himself is struggling to keep in communication with God. Solitary prayer seems empty. Hence a nightly journal. Something happens when he gets in a spat with a local big whig over negative publicity from a funeral for Michael Masana. It was held at a toxic waste dump with a choir singing an environmentally conscious Neil Young tune. Toller gets lambasted for his “political behavior,” though he was admittedly only upholding the man’s wishes. And yet he is beginning to question how people who proclaim to follow God cannot take a greater stake in preserving his creation. In documenting Martin Luther King Jr.’s efforts, Ava DuVernay’s Selma (2015) was a call-to-action in the realm of social justice. For all those people who claim or at least strive to be good, morally upright people, it is clear this is a universal fight. Likewise, First Reformed is a call or at least a meditation on environmental justice because humans are meant to be stewards. It is not completely about extremism (though Toller begins to inch that way) but in some ways, we are meant to live radical lives. Full of radical love and a radical conception of justice for the earth and other human beings. But one could say this is not the true punchline. For that we must revert back to some of the deep-set themes of Schrader’s career, returning once again to his first collaboration back with Martin Scorsese back in 1976. Because First Reformed has one of the most abrupt endings in recent memory. It catches us off guard on numerous fronts. We must start with the ambiguity which is nothing new. Travis Bickle entered the pantheon of cinema characters partially due to the enigma that clouds his fate in Taxi Driver. Most people who have ever been ambushed by the film will recall the ending. Travis goes on his crusade to clean up the filth and it’s a violent rampage in the eyes of the world but for him, it’s an act of triumphant heroism. In the final moments, he’s back in his cab again — his personal cathedral — driving the streets and there’s his untouchable girl, Cybil Sheppard, who appears in the back seat. He sees her through his rearview window and rides off. It seems almost impossible to read it in the literal sense. How could this be? Is this his own personal delusion? Could this actually be real? I know my own inclinations but I don’t know what to believe. First Reformed is much the same. Here we have the Reverend about to take his poison — looking to end his life — in the face of such a dreadful world. Then a door opens and there stands the one person who might save him, Mary, appearing in the doorway like an angel. They embrace and then beginning kissing and we spiral around and around them in one of the most violently uninhibited camera setups in the film. We have broken out of the harsh asceticism of the entire movie thus far. Is it about this salvation coming through the physical union between two people? This could be the Ordet-like resurrection or maybe like Taxi Driver it’s all part of the ultimate delusion. The bottom line is we don’t know and Schrader doesn’t tip us. Much like Silence, what’s paramount is what we fall back on in response. Can we read this as a story of despair or hope? The words of Toller echo through my mind, “Wisdom is holding two contradictory truths in our minds simultaneously.” This is First Reformed at its finest, ever oscillating between the two defining poles of any life. Pickpocket is an intricately staged, truly intimate character study from the inimitable Robert Bresson solidifying itself as one of his greatest works. As was his practice, Bresson took Martin LaSalle, a non-actor to be his leading protagonist. The Uruguayan-French actor sports gaunt, rather severe features, thick eyebrows, a sauntering gait and a slumped posture. However, there’s also some facial similarity to Henry Fonda there, except LaSalle is even more “normal” if you want to go that far. He seems altogether unextraordinary and still Bresson manages to tell an engaging story with such an unassuming star–not through emotions but the inverse–a complete lack of emotions replaced instead by actions. Aside from being a vagrant who lives in a dilapidated flat, Michel is a cynic who holds a bit of a superman complex. In fact, he’s not far off from Raskolnikov in Crime & Punishment. The difference being his crimes are more mundane. The outcome is less pronounced. But he too achieves a kind of redemption. With such a life as he leads, not working, with hardly any friends, or anything to do aside from betting on the horses, Michel fills his idle hours learning what it is to be a pickpocket. It becomes his livelihood as he joins forces with some accomplices, honing his trade, and gleaning inspiration from the life of pickpocket socialite extraordinaire George Barrington. Except Michel seems nothing like this man. He’s no adventurer or colorful personality. He watches the world with passionless eyes, lacking purpose, and hardly talking to anyone. When he does, it’s generally brusque. He’s not looking to make friends–aside from his “buddy” Jacques. He hardly even visits his sickly mother even when she’s lying on her deathbed. But that’s what makes his nearby neighbor Jeanne (Marika Green) all the more fascinating because she brings something out of him. It just takes him a long time to realize it. I cannot get it out of my head that Marika Green shares some striking resemblance to Natalie Portman. This notion shot into my head the first time I ever viewed Pickpocket. It serves no real obvious purpose but to suggest her stunning beauty and maybe even that there’s a modernness to her or better yet a timelessness behind her eyes that’s full of some sort of inexplicable power. Maybe Natalie Portman has that same quality as well. It’s difficult to say. It’s striking that many of the scenes in Pickpocket are almost silent, lacking scoring and often even dialogue, and yet they’re choreographed like the most elaborate dance. Instead of feet, though, hands are involved. The dexterous hands and limber fingers of pickpockets. And his eyes rove as much as his prying fingers. 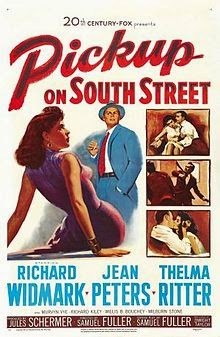 There are similarities here with Sam Fuller’s Pickup on Southstreet except in this case the life of a pickpocket, this life of second class crime is the extent of his existence. There are no gangsters, plots, or big implications pointing to Cold Wars and Communists. But if they share anything it’s their equally impressive understanding of economical filmmaking with the innate ability to tell rich, impactful stories in a highly condensed amount of time. Michel’s life is pitifully mundane in a sense and yet within that context, he’s still able to find hope and that’s the beauty of what Bresson suggests here through the simple functions of sound and image. He evokes a great deal. It was not the final words of Pickpocket that struck me but rather the image that we are left with. There stands Michel incarcerated in prison. It seemed inevitable. Because supermen do not exist, at least not in the way that he supposed. And yet in the same breath, when he shed that philosophy he found something better. He caresses Jeanne through the bars, kisses her face. Yes, he’s still trapped, stuck in such a horrible spot without his freedom. But the utter irony of it all in this one moment, before a very abrupt conclusion, Michel is finally free–finally saved by the graces of love and it took a prison cell to teach him as much. His life was propelled by inaction highlighted by contained moments of theft and deception. Therefore, it’s in this final instance that Michel finally shows some amount of goodness and affection bursting forth. His life no longer seems to be defined by being a pickpocket. For once, it’s defined by something else–by someone else. Whereas Raskolnikov realized that he needed Sonya to resurrect him much like Christ resurrected Lazarus, Michel comes to a similar conclusion here though he only believed in God for three minutes. Still, in a sense, he has been redeemed and now there’s a certain amount of hope in his life going forward. The straight and narrow is a tough road to traverse but Michel might find it yet. Robert Bresson’s film is an extraordinary, melancholy tale of adolescence and as is his customs he tells his story with an assured, no-frills approach that is nevertheless deeply impactful. There is one moment early on that sets the tone for the entire story to follow. Mouchette stands in her class as the line of young girls around her sing a song in harmony with one another. She is the only one not involved, standing sullenly as her headmistress passes behind her. In front of the whole class, her face is dragged down to the piano keys and she is forced to sing aloud, her pitch nowhere near the mark. She goes back in line with tears in her eyes as the girls around laugh at her sheer pitifulness. But as an audience, it makes our hearts twinge with pain. She is the girl who looks out of place at a carnival, her clothes frayed and clogs constantly clomping. She is the girl who doesn’t have enough money to pay for a ride apart from charity. She is the girl who gets hit by bumpers cars. She is the girl looking for a friend, but none can be found — the school girls having nothing to do with her and her father scolding her if she ever made eyes at a boy. She is forced to be mother, housekeeper, and caretaker as her mother lies in bed deathly ill and her swaddled baby brother cries helplessly night and day. When her father comes home he’s of no use and when he’s out he’s quick to drink. So in many ways, Mouchette understandably finds life unbearable. She never says that outrightly. In fact, I doubt a character in a Bresson film would say something like that because it wouldn’t feel real. It wouldn’t fit his MO. Still, every moment her head is tilted morosely or she trudges down a street corner dejectedly nothing else must be said. That’s why she slinks off into the surrounding forest and countryside to get away from all that weighs on her. And even there she cannot find complete relief. One such night during an escapade she witnesses what looks to be a fight between two men from town who have feelings for the same woman. As they are drunk in the rocky depths of a stream, such a confrontation does not bode well. When both men go tumbling down and only one gets up, Mouchette believes she is privy to a murder. The perpetrator Arsene sees her and coalesces her to keep a lie for him, making sure she doesn’t say anything. But she’s also not safe in his presence and so she eventually flees into the night. In the waning moments of the film, what we expected from the outset comes to fruition and Mouchette loses her mother, the only person who seemed to deeply care for her with reciprocated love. And as she wanders through town to retrieve milk for her brother, she turns off anyone and everyone who makes any pretense to help her. Of course, their help is always a backhanded or pious type of charity and in the same breath, Mouchette is not about to be thankful for them. It’s a self-perpetuating cycle of sorts. All parties are to blame. In the end, she seems to be at her happiest rolling down the grassy hills away from any sort of human sorrow or interaction. It’s a sorry existence highlighted by very few silver linings. Bresson’s film hits deep with numerous bitter notes, offering up a life that is wounded and broken. Mouchette’s tragedy is great but perhaps the most important question to ask is where does her solace come from? It’s interesting how Bresson often focuses on bodies in action, at times it almost feels like the characters are faceless. We know them, we see them but what they do and how they move speaks volumes about who they are. Posture, actions, desires, these are the things that define characters far more than even the words that cross their lips. Robert Bresson’s Balthazar is the best piece of art I have viewed in some time and it is art in the sense that it may have various interpretations, it causes us to think, and it elicits an emotional response. In truth, it is a story that I do not fully understand and I can never hope to know, but there is nevertheless an austere beauty to this parable. Furthermore, there is a kind of magic in this air of ambiguity. I want to watch it, again and again, to see if I can understand, to see what revelations come my way. It was one of those experiences that left me wondering what I had just watched, however, I know enough by now not to fight it, but enjoy that feeling of not comprehending in full. Essentially this is a tale about a donkey cherished by a young girl and over the years they lose contact, reunite, and go away again, as is the rhythm of life day to day. The plot points started becoming less important in comparison to the images and emotions that begin to well up inside of us. At the same time that the donkey is often being mistreated or carrying the burdens of his various masters, his girl Marie (Anne Wiazemsky) is growing up trying to figure out what love is. She is close to a boy named Jacques only to have him drift in and out of her life several times. She cannot decide how she feels exactly about him. There’s the boy Gerard who is good at raising hell and Marie spends some time with him. But it remains to be seen what the real agenda of her parents or Gerard and his friends are. What of these matters of honor and murder? Do all the particulars even matter that much? Balthazar’s own path includes whippings, long hard toil as a beast of burden, a stint in the circus with all the other captive animals, and happy times driving Marie’s cart. But is that wrong to personify him? Is he even capable of emotion? I’m not sure if he is, but the audience certainly is. We can be joyful when we see that cute young donkey being enveloped in hay with young children playing. We can become somber as Balthazar is slowly being worked to death as the years drag ever onward and his master considers putting him down in lieu of getting a new harness. Somehow a donkey can be a victim of his circumstances, bravely taking the abuse of others, and living without a shred of retaliation. In some strangely entrancing way, it works. Then, Balthazar takes a stray bullet and weakened he comes upon a green pasture where he kneels down peacefully to die. Around him comes a flock of sheep led by a shepherd. It’s a deeply heart-wrenching and visually arresting moment evoking Biblical imagery from Psalm 23. The full life having been lived and now it’s over in tranquility. It’s really a summation of the spiritual journey that each one of us traverses in our lifetime and yet Bresson brings us this allegory through simple, clean strokes. Images and sounds balanced exquisitely together in a completely naturalistic mode of expression. 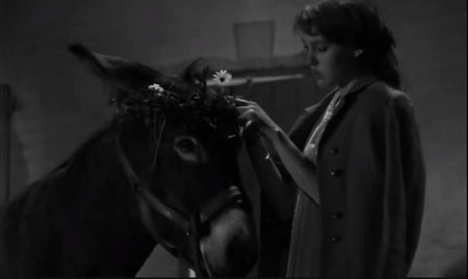 Wiazemsky on her part is a natural beauty who positively captivates with every move she makes (reminding me of Anna Karina) Furthermore, Bresson somehow causes us to build a deep connection with a donkey which is hard to believe. It’s the trademark of Bresson to have a stripped-down, straightforward approach to film-making, so much so that his style almost feels like no style at all. It’s so clean and unobtrusive. He shows us the world simply, succinctly, and without pomp. 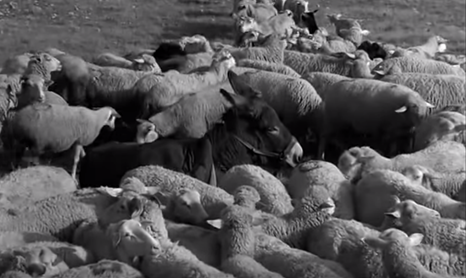 Even with the casting of non-actors, and in this case a donkey, as his main players. But he’s undoubtedly the master of inducing a response based on even the most basic of subjects. There are times it’s almost easy to forget you’re watching a film entirely because you get so wrapped up in what he is showing us. From American cult film director Samuel Fuller comes a brief, yet potent film-noir laced with communism, pickpocketing, and a lot of shady business on the streets of New York. Grifter Skip McCoy (Richard Widmark) is just recently out of the can, and he is back on the streets up to his old tricks again swiping wallets. His victim this time around is a pretty young dame named Candy (Jean Peters) who has a mission of her own to drop off a package. Neither of them knows quite what they have gotten into and to start off with, nothing happens. What exactly has Skip stumbled upon? The answer includes microfilm, spies, and the Commies. All of a sudden things are hot, as McCoy tries to cut a deal with the Reds, and Candy tries to recover the film she unknowingly lost. Candy gets caught in the middle of her boyfriend who is sided with Communists and Skip who wants to cash in on his good fortune. Between Skip and Candy begins a wild and passionate love affair that seems destined for disaster. Both have their own agendas, but it is ultimately Candy who drops hers because of her new found affection. McCoy is callous at first but he comes around, in the end, leaving this noir on a surprisingly positive note. Thelma Ritter was usually colorful in her many screen appearances and she has another memorable turn as the wheeler-dealer Moe Williams in this film. However, Moe does not just deal ties and secrets; she is a woman with a conscience and a touch of good old-fashioned patriotism. In her own simple way, she is a hero whether people know it or not. Widmark played a similar conman in Night and the City (1950), but this time around things worked out a little differently for his character. The pickpocket sequences were perhaps less elaborate but still similarly intricate to Robert Bresson’s Pickpocket (1959). It is possible that he got some of his inspiration from Fuller’s work here. This is a real communist era thriller that Fuller injects with passion, grit, and some unadulterated violence. It is not a pretty film necessarily, but that is not what Fuller is going for, and he never does. Instead, as a former journalist, he reveals to his audience the nitty-gritty of South Street up close and personal. He succeeds with flying colors in delivering a first rate scoop of uncompromising pulp. At hardly an hour and 20 minutes, you would think Ida has very little to offer, but that just is not the truth whatsoever. Polish director Pawel Pawlikowski blessed us with a nuanced film full of power and strangely pleasing visuals. It’s stark, yet crisp, black and white cinematography did not have to be that way, but it looks absolutely beautiful. In the opening sequence, we see a young nun carving a statue and then carrying it to the grounds outside. We realize it depicts Christ and it feels rather reminiscent of La Dolce Vita and yet this film has a note of reverence. We have been transposed to Poland during the 1960s where novice nun Ida lives a simple and disciplined lifestyle within a convent. The meager plot follows her pilgrimage to meet her only relative before taking her vows. It’s the aunt who refused to take her in after Ida’s parents passed. They have never met before now. There doesn’t seem to be much to say. In fact, what can you say? Ida has taken up a religious calling and her aunt, a former judge named Wanda Gruz, lives life the way she pleases. Men, alcohol, and smoking are all a part of that lifestyle. Thus, they have little in common until the moment when Gruz discloses the truth to Ida. Her real name is Ida Lebenstein. She is Jewish. Her parents were killed during the War, but the details are not too clear. They can probably guess how it happened. Ida’s whole identity is rocked because she is now a Jew within a convent which seems like a gross incongruity. Ida’s resolve is to find her parents’ resting place and so the unlikely pair set off looking for answers. That’s about all the film’s plot right there, and though it does not sound like much, it is far more engrossing than a lot of the other fair we come across. There are moments when it feels like we are watching something from Robert Bresson. It’s simple. There are not frills but it is chock full of humanity and seemingly real characters with real emotions. Ida is very rarely in the center of the frame, more often than not her eyes are averted, looking away from the camera. Pawlikowski also has a curious habit of focusing on one character during a scene of dialogue. It seems to denote how isolated and confused many of these characters are. It’s one of those films that leaves us with more questions than answers and that lends itself to a truly insightful viewing experience. This French film directed by Robert Bresson, begins with voice-over narration of a man recalling his past. Michel is a nondescript person who was down on his luck. Then, one day he ineptly tried his hand at pick pocketing and was caught. He got off and over time he sharpened his skills and teamed up with two other men. They successfully bring in a great deal and it becomes Michel’s livelihood. At the same time Michel’s mother is becoming ill and he meets a young neighbor named Jeanne. Michel’s best friend is falling for this girl while Michel himself is continually tempted to steal. This leads to a little trouble from a police inspector and yet he stays out of jail. However, after further discussion with the chief and Jeanne, Michel leaves Paris. He returns later still impoverished, to find Jeanne with a child but unmarried. He resolves to support her and yet after trying to work, he reverts back to his past vice. This time his guard is down and he winds up in jail. Jeanne comes to visit him a great deal and through this devotion he realizes they both are in love with each other. This film has simple but intriguing topic. Sometimes the pick pocketing scenes are shown almost as a choreographed dance which is done so fluidly. 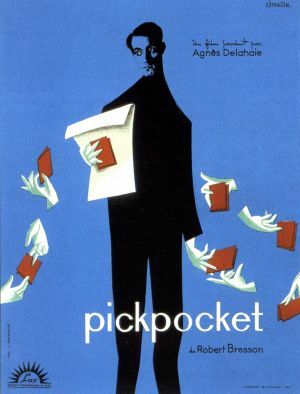 Overall Pickpocket has a striking resemblance to Doestoevsky’s Crime and Punishment but it reflects the wonderful simplicity of Robert Bresson’s realistic style. Is it just me or does Marika Green look like Natalie Portman in black and white. I certainly think so.